The National Research Council of Canada is supporting the development of standards that integrate and enhance climate change adaptation, two of which are in the field of bioretention. Public comments are open until April 23, 2018 for the construction standard; and May 27 for the design standard. See links to review the documents below. 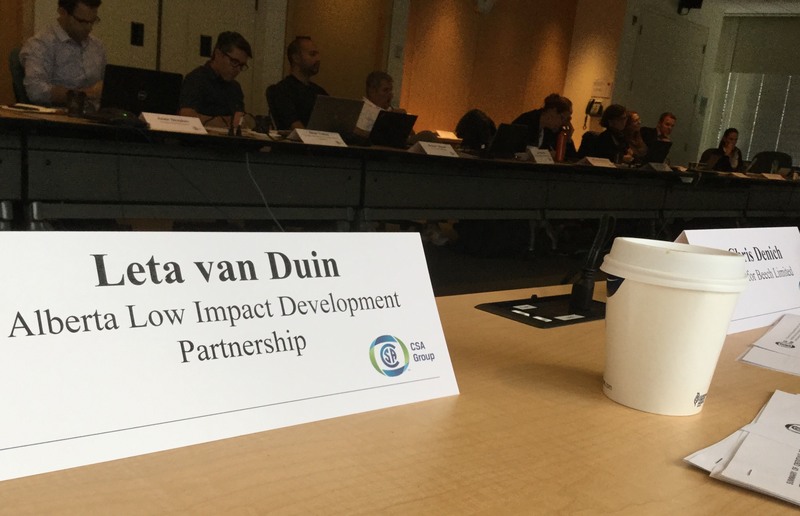 ALIDP partners participating in the development of the guidance include Craig Kipkie, Kerr Wood Leidal; Bert van Duin, City of Calgary; Mike James, Deeproot; Jim Laidlaw, Stantec, Ken Clogg-Wright, MPE Engineering; and Leta van Duin, ALIDP. W200 Design of Bioretention Systems, the first National Standard in Canada of its kind, is now posted for Public Review. The Design Standard covers requirements and recommendations in key areas such as: roles and responsibilities, site planning, criteria and constraints, cold climate suitability, background investigations, design process and system sizing. W201Construction of Bioretention Systems, the first National Standard in Canada of its kind, is now posted for Public Review. The Construction Standard covers requirements and recommendations in key areas such as roles and responsibilities, documentation, construction considerations, construction sequencing, erosion and sediment control (for bioretention), materials and materials handling, installation considerations, landscape considerations, construction warranty maintenance and assumption protocols. Increased urban densification results in more impervious surfaces that, coupled with an increase in frequent and extreme precipitation events, can lead to contaminated stormwater runoff and flooding. Bioretention is a sustainable stormwater management practice that retains and treats contaminated runoff. This practice is an engineered system that promotes infiltration that treats, stores and evapotranspirates stormwater runoff using a filter bed comprised primarily of bioretention media and vegetation. For any questions please contact Lynn Barber lynn.barber@csagroup.org or (416) 747-2320.